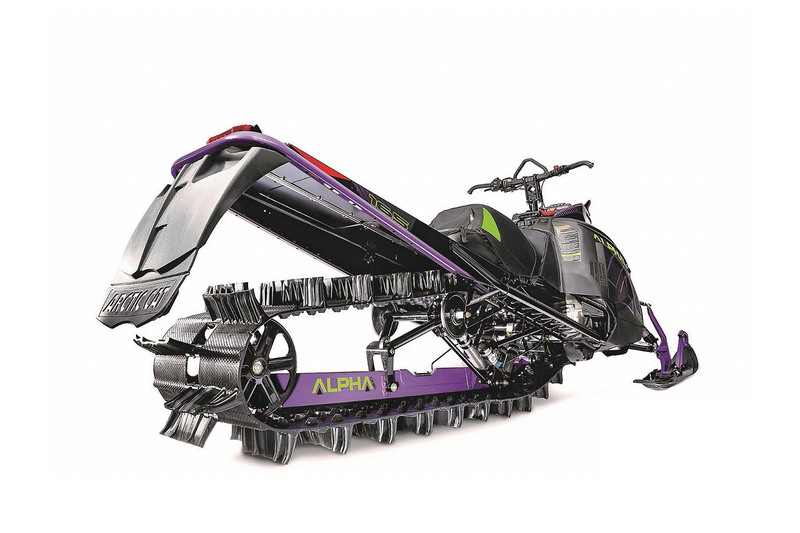 It seems like Arctic Cat has always been playing catch-up in the mountain marketplace and has stood firmly planted in the shadow of Polaris and Ski-Doo. This trend could be shifting quickly. 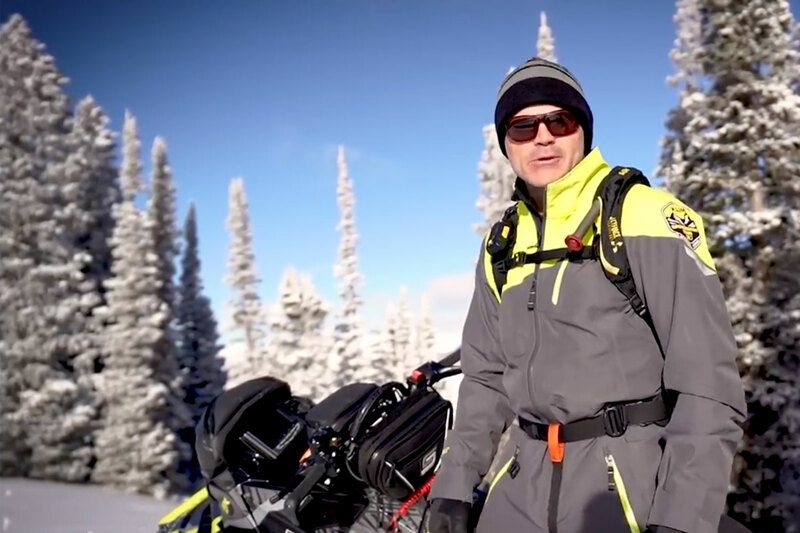 Arctic Cat mountain team leader, Andy Beavis, and his engineering group have been burning the midnight oil to meet and exceed those competitors and have given mountaineers something truly different that works. Some of the issues the team has addressed are 1. Weight 2. Panelling-out on side-hills 3. Ease of Side-hilling and 4. Crisp, immediate throttle tip-in. Cat successfully dealt with throttle response last year when it brought out its new DSI 800. This slot-injected 155-hp twin is exactly what the vert crowd needed and delivers the kind of braap-braap throttle response you require when you're performing powder maneuvers. That alone makes a huge difference. Cat's recent mountain bodywork is actually inches narrower than previous designs and allows the rider to weight the sled and run sidehills so the lower bodywork prevents the uphill ski coming unattached from the snow. Good uphill ski bite is the key to sticking on sidehills as you’re standing on the inside running board. Also, those boards are about an inch narrower and sculpted so the riders feet are more forward for better balance. All of these changes, combined with lighter, skinnier spindles up front allow less drag and better agility in deep powder. Without a doubt he biggest change this year is a new mountain specific skidframe design called "Alpha One". This is where things get super-interesting: Basically Cat took all the old deep snow skidframes and track design concepts and threw them out the window. Alpha One is what is referred to as a "single beam". The skid is extremely narrow and is situated dead in the middle of the track – there is one slide rail – not two! Not only does this reduce the number of parts but it’s much lighter - and the weight reduction is of the unsprung variety to make everything more efficient. Snow build-up inside the track is remarkably reduced and the best part is yet to come: Alpha One allows the rider to lay the sled over on the outside edges of the track so easily, it’s like riding a bicycle. Actually, it’s more like riding a Snow Bike. The single beam skid's center rail is hollowed-out for better rigidity and lightness and uses magnesium at its attachment points. The 3-inch lugged track is a special design, intended to flex and twist from its center fulcrum so the rider can pivot the sled in powder and run sidehills with maximum grip. Pulling powder hooks with this sled is so easy, you don't even have to think about it. There are large windows in the center of the track only. Not having to think about anything is a big part of Alpha One's appeal. Our test riders told us, after getting over the shock of how the Alpha skid looked, in the mountains they didn't even think about what it was doing differently. The whole thing was transparent and except for the improvement in the way the sled side-hilled and turned up hill, it was down to basics - just ride the thing and enjoy its agility. 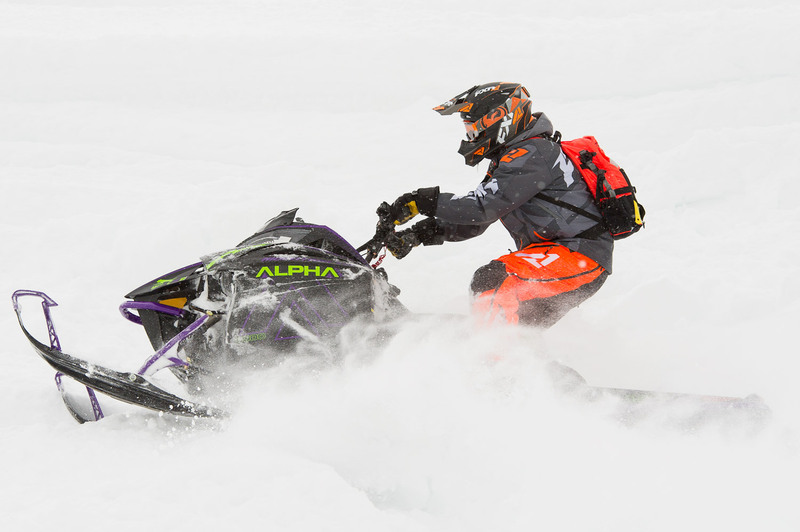 Since this skid relies on its twisting, flexing track on sidehills, there's a grip factor you don't experience with other mountain sleds that tend to grab the sidehill with the "edge" of a less flexible track. In side-hill situations our testers felt the sled taking a slightly different stance than they were used to - almost pointing slightly uphill with the track churning - yet continuing to run 100-percent lateral to the incline as power was applied. There may be changes in how the Alpha attacks sidehills and powder, but an attack it will be!